H. Rick Bamman - hbamman@shawmedia.com Kane County Cougar starting pitcher and Praiirie Ridge graduate Michael Heesch sits in his team's dugout prior to taking the field for warm-ups Sunday, April 7, 2013. 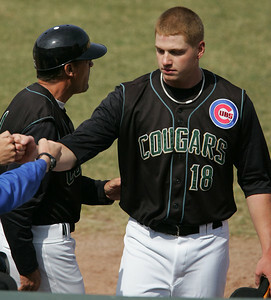 The Kane County Cougars are the Cubs' Single-A Midwest League affiliate. Heesch pitched on Prairie Ridge's 2008 4A state championship team. H. Rick Bamman - hbamman@shawmedia.com Prairie Ridge graduate Michael Heesch in his windup against the Quad CIty River Cats Sunday, April 7, 2013. H. Rick Bamman - hbamman@shawmedia.com Prairie Ridge graduate Michael Heesch tosses his first pitch as a Kane County Cougar Sunday, April 7, 2013 against the Quad City River Bandits. H. Rick Bamman - hbamman@shawmedia.com Prairie Ridge graduate Michael Heesch helps his own cuse by filding a grounder and tossing to first for the out in the second inning Sunday, April 7, 2013. 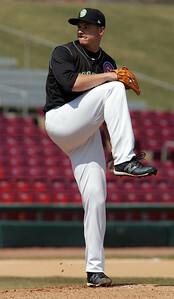 Heesch made his piching debut for the Kane County Cougars, the Cubs' Single-A Midwest League affiliate. 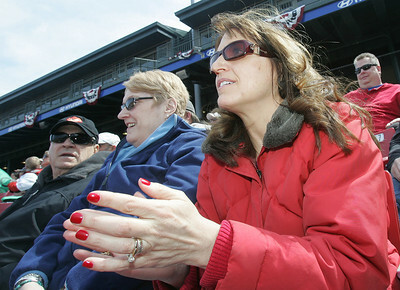 H. Rick Bamman - hbamman@shawmedia.com Prairie Ridge graduate Michael Heesch's grandparents (from left) Sam and Maureen Girardi along with his parents Terrie and Fred Heesch watch from the stands Sunday, April 7, 2013 at Fifth Third Bank Ballpark in Geneva. H. Rick Bamman - hbamman@shawmedia.com Prairie Ridge graduate Michael Heesch slaps down a River Bandit hit Sunday, April 7, 2013 at Fifth Third Bank Ballpark in Geneva. Heesch pitched on Prairie Ridge's 2008 4A state championship team. H. Rick Bamman - hbamman@shawmedia.com Kane County Cougars' Michael Heesch returns to the dug out after striking out a River Bandits batter Sunday, April 7, 2013. Heesch made the start for the Cougars and limited the River Bandits to just one hit in 6.1 innings. That hit came in the top of the fifth. Prairie Ridge graduate Michael Heesch slaps down a River Bandit hit Sunday, April 7, 2013 at Fifth Third Bank Ballpark in Geneva. Heesch pitched on Prairie Ridge's 2008 4A state championship team.